A landmark session of the Chinese National People's Congress has opened in Beijing to discuss comprehensive reforms for the Chinese economy as it slows down, as well as create effective governance mechanisms to combat corruption. Parliamentarians will consider reports on the implementation of a plan for social and economic development of China in 2015. 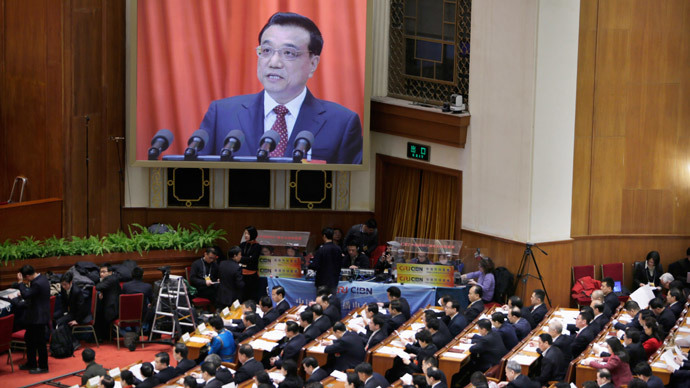 China's economy will grow by 7 percent in 2015, said Prime Minister Li Keqiang on the eve of the 10-day annual session of the National People's Congress. The 7 percent target is part of China’s economic reforms to depend more on consumer spending and trade rather than exports and credit-fueled growth. The country has to combine goals of growth as well as financial and economic reforms to achieve this. “Systemic, institutional, and structural problems have become ‘tigers in the road’ holding up development,” Li said. Such a low growth rate once again confirms the slowdown in China’s economy and at the same time emphasizes the authorities' commitment to the transition from the fast-growing model of development to a more moderate, but qualitative one. The news came as no surprise to the market, and generally coincided with analysts' expectations. In addition, inflation will be 3 percent, down from 3.5 percent in 2014, and a budget deficit of 2.3 percent of GDP. China's GDP growth was 7.4 percent in 2014, lower than the target for the first time since 1998. In an attempt to stimulate the country’s economy, the People's Bank of China has twice reduced interest rates and reserve requirements for banks since November. In order to stabilize economy, the government also intends to expand the use of foreign exchange reserves. To increase the competitiveness of Chinese goods, the country’s monetary authorities fell back on weakening domestic currency. As a result, the rate of the yuan against the dollar is at its lowest in two and a half years. Even though the Chinese economy is no longer expanding at the frenetic pace it did a few years ago, it is still expected to be the fastest growing in 2015, according to analysts polled by Bloomberg earlier in February.